Buy 1/2 oz First Majestic Assorted Silver Rounds | ?? 1/2盎司First Majestic组合银圆 These 1/2 oz silver rounds are unique in that they are sold by the same company that mined and refined the silver. 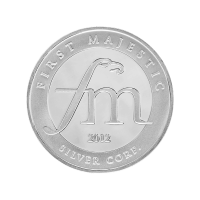 All of First Majestic's silver is mined in Mexico, hence the Mayan themes on their rounds. The obverse features a unique and detailed Mayan design, along with the fineness and weight of the round. The reverse showcases the First Majestic logo encircled "First Majestic Silver Corp."